America’s Cup races are not on a fixed schedule and particulars for the next venue were just announced: 2017, Bermuda. 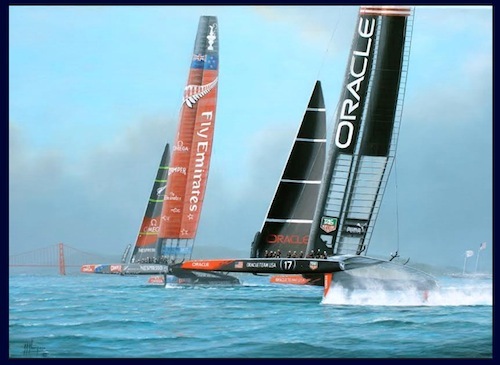 If there is such a thing as a Grand Prix for sailing it’s surely the America’s Cup. It’s often described as the most difficult trophy in sport to win and is certainly one of the oldest, having been first contested in 1851. And unless you’re in the habit of doling out Bugatti Veyrons as graduation presents, its sheer expense has made participation as unattainable as it is unrelatable to most. It probably doesn’t help that this is very much a male-dominated sport, the only “ladies” being the boats. This book tells the 150-year story of the race in the form of oil paintings created between 1986 and 2014 by Tim Thompson (UK), self-taught but now one of the luminaries among living marine artists. That first race, around the Isle of Wight, was won by the 30-ft America from New York City and thus what was initially the Hundred Guinea Cup became the America’s Cup. It might have had to get that name anyway because American crews would hold on to the cup for over a hundred years and only three other nations ever fielded a winning boat. The venues, formats, and regulations have changed many times over the years and so a book like this is a good way to see what all the hoopla is about. 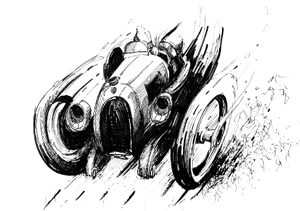 A key feature of the actual race is that, since the 1920s, it involves only two boats, a defender and a challenger determined through a series of elimination rounds. The rules are so complex that the 1988 win had to be decided by the courts and led to a rule change! 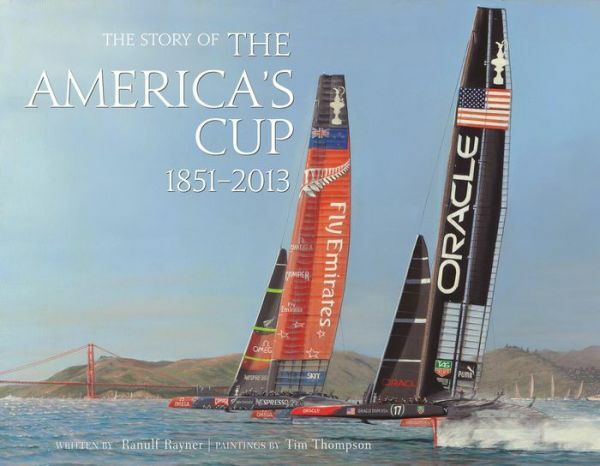 Reprinted various times (2000, 2003, 2008) under various titles by various publishers, this book traces its roots to the 1986 The Winning Moment: Paintings of the America’s Cup, 1851–1987. 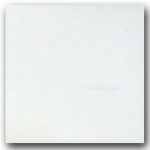 Most of these editions can still be found with little effort and most have a similar physical (landscape, 14.25 x 11”) and conceptual format to this latest offering. That the manuscript ever made it into print is all the more remarkable when you consider two mishaps that could have sunk the project: first a cat had a fat paw and stepped on the Delete key on the author’s keyboard and wiped out the index to all his research files, and then on a research trip to New York he got robbed, losing the only copy of the first few chapters. 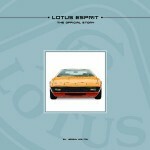 Following a Foreword by Cup winner Ted Turner, the author introduces himself and the artist. Attentive reading is rewarded by discovering an interesting dynamic that must have made the collaboration between the two especially sympathetic: Rayner regrets having had to give up his amateur pursuit of painting in the interests of a commercial life in farming, and Thompson was forced by an accident to abandon a career in horticulture to turn his painting hobby into a full-time profession. After briefly summarizing the Ladies (the boats), the courses, and the post-1992 specs of the current class of these racing yachts (“Already by 2007 the investment in the Cup by just four competing syndicates had exceeded the cost of NASA sending a space shuttle into orbit!”) a “Rogues’ Gallery” presents short bios of 16 of the especially colorful skippers so as to properly convey to the reader the type of person it takes “to win at all costs.” The b/w portraits in this section are drawn by the author’s wife. Thompson’s intention is to present the “battling racing yachts at the most significant moment of truth or protest, of triumph or disaster.” The use of the word protest (here an exercise of a specific action under the Racing Rules of Sailing requiring, in the absence of marked out-of-bounds lines or referees, self-enforcement) is indicative of a presumption the author/s make about the reader: familiarity with sailing/boating conventions. Expressions such as “shipping it green” or “stepping a mast” may be just as lost on non-salts as abbreviations like LOA (length overall) or LWL (length waterline). The efforts made, first by Rayner to thoroughly research the voluminous recorded history so as to identify that crucial event on which a race may have turned, and then by Thompson to render it just so (light, wave action, who on deck does what/where/when) cannot be overstated. In one particular case, photos a spectator had taken in the 1930s through a telescope immortalized the fateful “luffing” incident that forced one boat to change tack—costing it the lead and the race. In painterly terms it probably needs to be said that Thompson’s people often have a certain Claymation-like stiffness in regards to motion, proportions, detail. The size of the original paintings is not stated and readers interested in larger prints are directed to contact the author. The book ships with one loose print for framing.